I thought my step dad made up the word coddle. It just sounds made up, doesn’t it? Then I grew up and discovered Google; coddle was one of the first things I searched for. Turns out he not only didn’t make it up but it’s actually a very popular traditional Irish dish. My mom used to make Dublin Coddle on poker night and my dad would eat it the next morning. He called it his hangover cure. I’ve never tested the effectiveness of Dublin Coddle for a hangover but with all the carbohydrates in it I can see how energy wouldn’t be a problem. That and the fact that Irish women have been making this for decades leads me to believe it works! 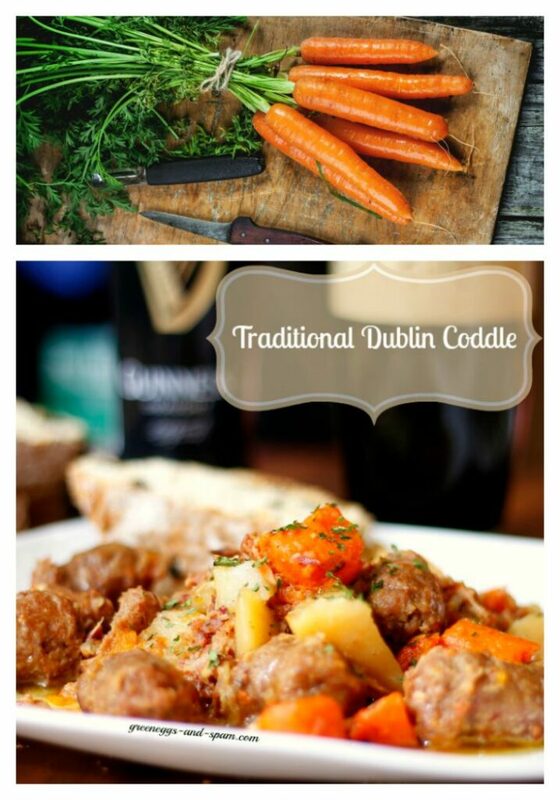 Dublin Coddle is often made by Irish wives on nights their husbands frequent the pubs. Since it can be left simmering on the stove the wives can go to bed instead of waiting up to make sure the men eat. 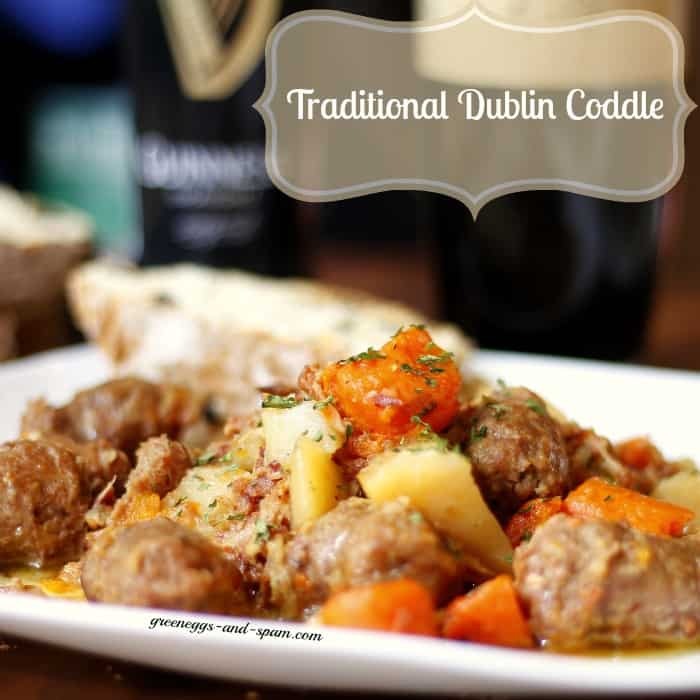 With St. Patrick’s Day around the corner Dublin Coddle will make a great addition to your menu. It’s even better if you have an Irishman in your family! Serve it up with some Irish Soda Bread and a Guinness for a traditional Irish Meal that will leave them reminiscing about the Emerald Isle. This traditional Irish dish is well known and loved. Add 1 cup of water to your crock pot and turn it on high. Drop in the beef stock cube and stir until it dissolves. Chop your bacon and fry it in a large skillet. Slice the sausage how you would prefer – in half or 4’s. Add the sausage to the frying bacon. Cut your onions into rounds and add them into the sausage and bacon; fry until translucent. Peel, rinse and cut your potatoes into large chunks. Cut up your carrots. Once the meat and onions are through cooking add them into the crock pot. Top with the potatoes and carrots. Put the lid on the crock pot and cook at high (4 hours) or low setting (8 hours) until done. I’ve got to try this recipe out. This looks delicious! I love recipe I can throw in the slow cooker and forget about for the day. I had no idea it was that easy! I am so making it this year! I’ve never heard the word coddle either. This recipe looks really yummy though! This looks so delicious! I love anything cooked in a crock pot. This sounds delicious. I love anything you can make in the crockpot. That looks yummy! Hubby would love it because it has sausage in it! Made this tonight and was not disappointed at all! A new family favorite for our special St Patty’s day meal. So very easy as well! I am a huge fan of Irish food – and that looks delicious! I made this today…and WOW!!!! The kids loved it, I made inappropriate noises when I ate mine and the husband had 2 huge bowlfuls. 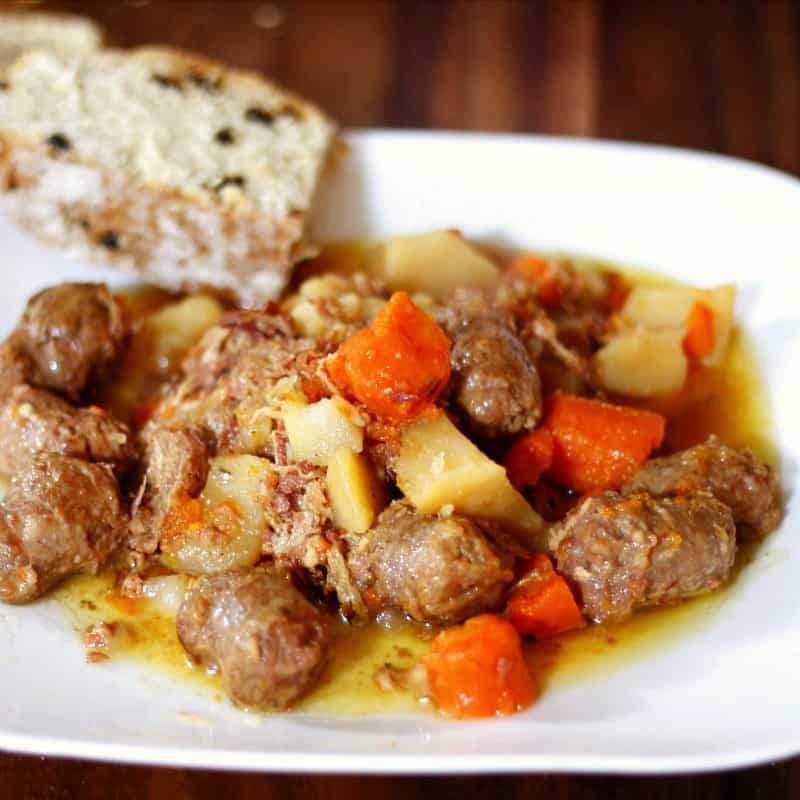 I grew up with my Irish grandparents eating coddle on a weekly basis. Coddle is in fact a type of milk stew, albeit a great recipe, its far from being a true coddle. do you need to pre cook the potatoes at all? Or will the crock pot do the work for you? Cheers! I used lager rather than water, and beef base paste. Took it to a whole new level. Bold awesomeness! Wegmans irish bangers were tasty!